Is Scouting really as good as it’s cracked up to be? Does it really prepared kids for life? Is it really any better than the scores of other activities that kids can participate in? 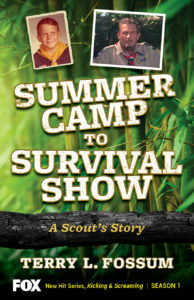 Summer Camp to Survival Show tells the story, in his own words, of how Scouting affected Terry’s life every step of the way. From becoming the Officer of the Year for Fairchild Air Force Base and Humanitarian of the Year for all of Strategic Air Command, to a multimillion dollar earner in direct sales, to a global philanthropist, to representing all of Boy Scouts of America on a survival reality show, Kicking and Screaming, on Fox. This quick-read book is perfect as a gift, award, or personal read for anyone who is in Scouts, thinking about joining Scouts, or has ever been connected in Scouting in any way. FOR THE FIRST PRINTING RUN ONLY, EACH BOOK WILL BE PERSONALLY SIGNED BY THE AUTHOR!